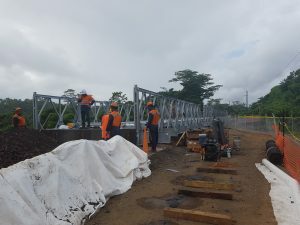 Fiji Roads Authority (FRA) is pleased to announce that the Kasavu Bailey Bridge in Tailevu is progressing well and will be completed ahead of schedule by 2pm on Thursday (April 13), weather permitting. Confirming this, FRA Chief Executive Officer John Hutchinson says the Bailey Bridge is single lane for buses, cars and trucks accommodating all legal load limits with a speed restriction of 15km/ hour. This follows after the large slip at Kasavu/Baulevu Road Junction which had taken a great portion of the road due to the heavy rain triggered by Tropical Depression 04F in December last year. In light of this, Mr Hutchinson said the FRA contractors have worked tirelessly around the clock to ensure that the Bailey Bridge can be completed ahead of schedule. He said that traffic controllers will manage traffic through the site until the traffic lights are installed at Kasavu. The cost to install the Bailey Bridge solution was $398,500 (VEP).